This smoky pendant gives the impression of a rare gemstone mined from the depths of the earth and polished and cut into a lovely heart-shaped design for all to see. 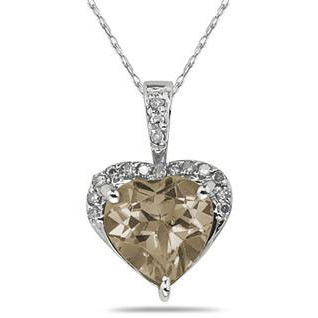 This 8 mm Heart-Cut Smoky Quartz and Diamond Necklace in 10K White Gold is quite different from other gemstones and not your average piece of jewelry. This incredible smoky quartz (8 x 8 mm, 2.25 ct.) is cut into a heart shape, which creates multiple facets for the light to easily penetrate the stone, lighting it from within. The intriguing mineral color gives this smoky quartz a very distinct look and appeal. Contrasting nicely around the edge of the gemstone is a 10K white gold heart that enhances the shape of the stone. Also, the gold acts as a setting for round-cut white diamonds (0.08 t.c.w.) that add extra flare to the piece. Never before has such a perfect match of smoky quartz, diamonds and white gold been paired together in one brilliant pendant. We guarantee our 8mm Heart-Cut Smoky Quartz & Diamond Necklace 10K White Gold to be high quality, authentic jewelry, as described above.